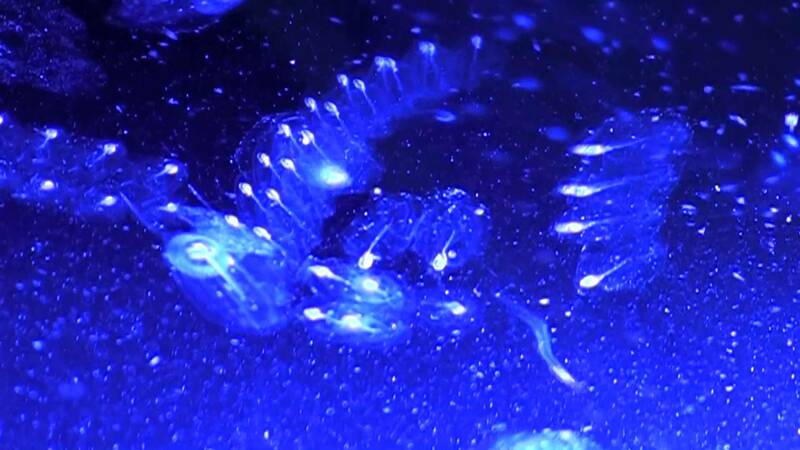 These salps were filmed several years ago and we have been wondering, has anyone seen salps yet this year? I’ve been checking but have yet to see. Please email (kimsmithdesigns@hotmail.com) and let us know if you do, and where they were spotted. Thank you! Sea salps are warm ocean water creatures, exploding in population during algae blooms. With beating heart, notochcord, and gills they are more closely evolutionarily linked to humans than to jellyfish. Sea salps are individual creatures that through asexual reproduction, can form linear chains up to fifteen feet long! Salps are planktonic (free floating) members of the subphylum Tunicata. Tunicates get their name from the unique outer covering or “tunic,” which acts as an exoskeleton. The sea salp’s tunic is translucent and gelatinous; in some species it is tough and thick. This entry was posted in Cape Ann Wildlife, Life at the Edge of the Sea and tagged algae bloom, bioluminescence, La Luna, Lucy Schwartz, luminescent sea salps, planktonic tunicates, Tunicata on September 17, 2018 by Kim Smith.